Constructed from heavy-duty steel and aluminum, SECO-LARM’s SK-1123-SQ features two Form “C” relays rated 5A at 28VDC and 1A at 28VDC. Each relay features an independent egress input that can be programmed from 1 to 99 seconds. A built-in tamper-switch rated 3A at 12VDC and high- security screws offer vandal-resistant protection. Up to 110 user codes can be programmed; each code can be 4 to 8 digits in length. 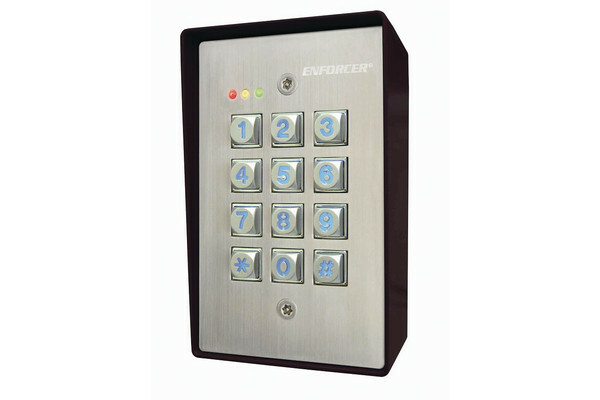 Other features include illuminated keys for easy nighttime use, 12-24 VDC/VAC dual voltage operation, door- forced-open and door-propped-open alarm outputs, and over 100 million user code combinations. Each relay can be programmed for momentary (1-999 seconds) or latch. Code flexibility: Codes can be 4~8 digits long. Egress input for exiting the protected premises. Dual voltage: 12~24 VDC/VAC operation. Tamper switch: N.C. dry contact 3A@12VDC. Mantrap – For a protected area with 2 doors, this feature allows only 1 door to be open at any time. All features are programmed directly from the keypad: No need for an external programmer. Duress output: signals a silent alarm if an authorized user is forced to open the door under duress. Keypad can be programmed to emit beeps for key presses or operate in silent mode. EEPROM memory protects programmed information in case of power loss. — Auto: No # key required after each code. — Manual: # key must be pressed after every code. SK-1011-SQ and SK-1131-SQ Digital Access Keypads also available. Contact SECO-LARM for details. Low current draw suitable for solar applications.